Your makeup brushes and tools come in contact with a lot of things which lead them into accumulating bacteria. This is the reason why you must take care of them and cleaning makeup brushes after every use or at least once a week/month. When I first started using makeup, I was not aware of the fact that makeup brushes must be washed too and as you can guess, I developed rashes and some milia on my face. 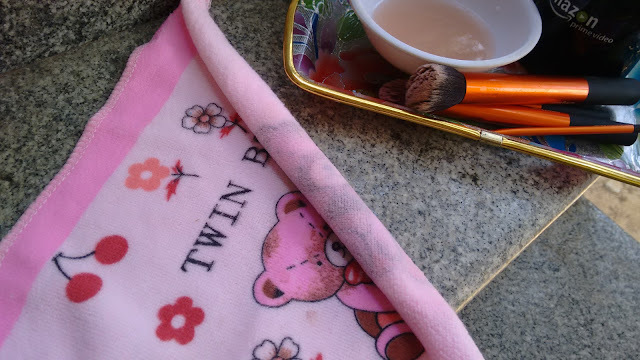 At first I thought that I have hyper sensitive skin which is reacting to me using makeup but later I learnt that the case here was different and the culprit were my makeup brushes which I had never washed. O_o Not cleaning makeup brushes regularly can lead to clogged pores, breakouts and acne. After I started cleaning my makeup brushes every month(too lazy to do it every week) I noticed a drastic change in the way my skin reacted to makeup and the feeling of using clean makeup brushes every time was one of its kind! 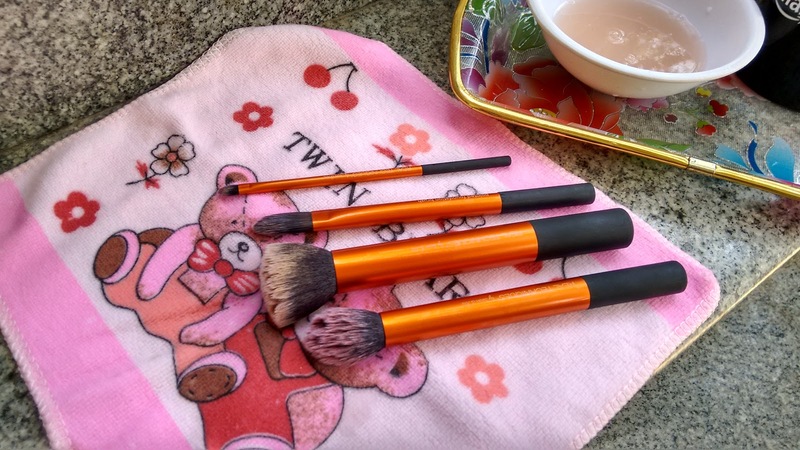 I never took extra care while washing my regular brushes and used to zig zag them in shampoo and rub them vigorously under the tap until they were clean. This resulted in my brushes losing their charm and the bristles coming off. 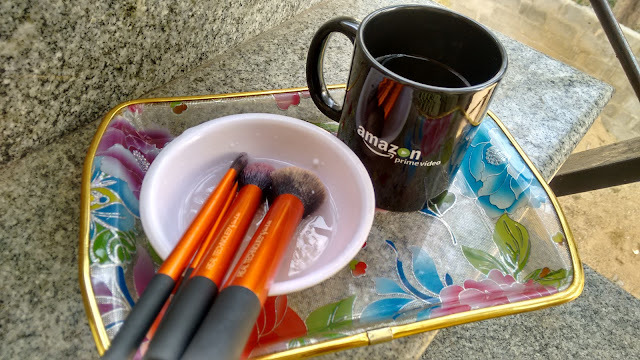 It was when I started investing in good quality makeup brushes like the Real technique core collection brush set and my PAC brushes that I started taking extra care as these were SO dear to me and I didn't want to lose even a fraction of a bristle off them! 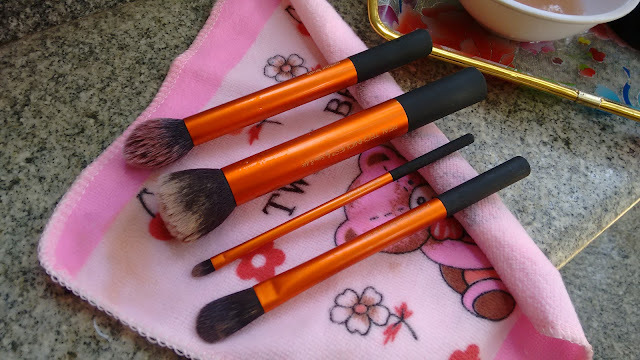 It's been more than a year since I am collecting and using these beauties and here I am, sharing with you the most effective way to cleaning makeup brushes and maintain their shape and fluffiness while you do so! 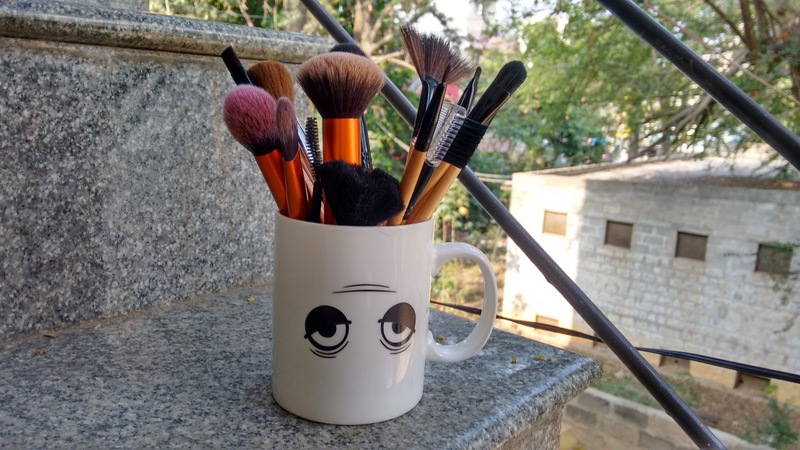 How often do you need to clean makeup brushes? 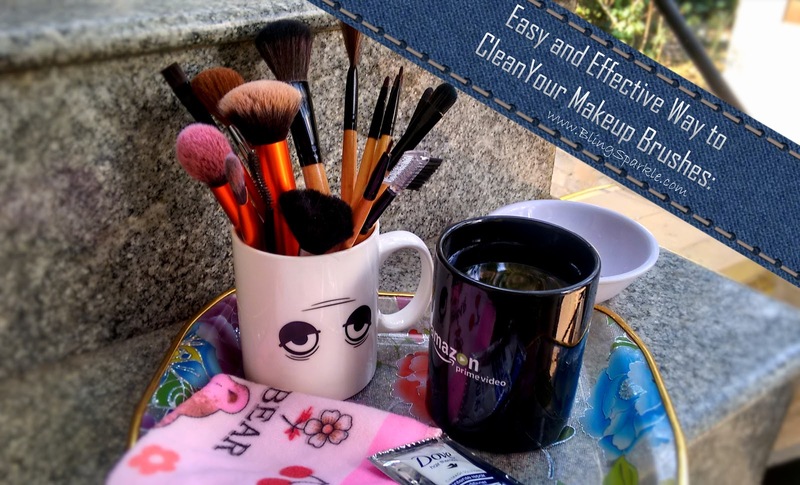 You need to clean makeup brushes once a week if you wear makeup on a daily basis, else, once a month will do. I used to do it once a month but now I make an attempt to wash them every 1-2 weeks. 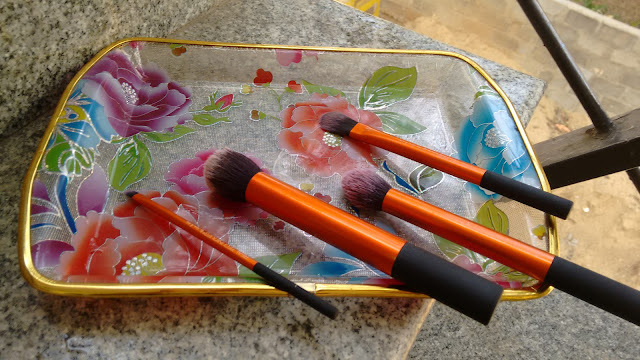 Start with examining your makeup brushes: Makeup brushes used for liquid foundations and other cream based products won't get cleaned completely with soap and water. An extra step with olive oil/baby oil is required, hence, its good to first examine the makeup brushes and clean them accordingly. 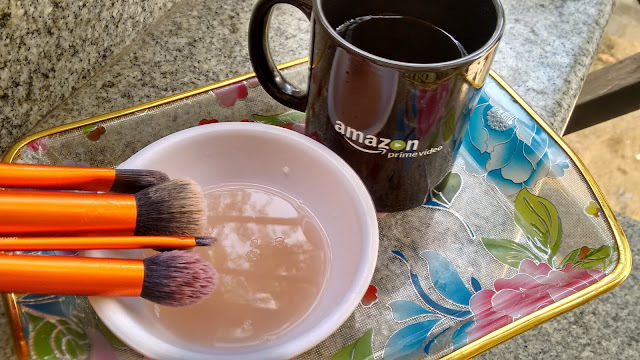 Take some olive/baby oil in a small bowl and start swirling your brushes gently inside it so that the oil nicely absorbs and cleans the dirt and makeup in the brushes. If your brushes have been used only for powder based products then skip this step. Take a bowl filled with luke warm water and add some shampoo to it. Now swirl your brushes in this mixture. Doing this will not only clean your brushes but also remove any oil residue. 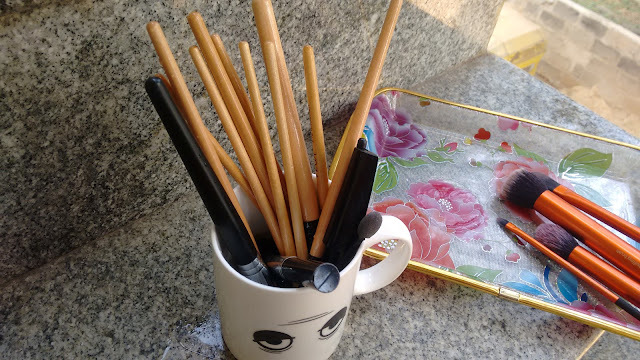 Once you are sure that your brushes are completely clean, dip them in the cup filled with lukewarm water and swirl gently. This will remove the residue from the shampoo. I like to do an extra step of running my brushes under tap water to completely remove any residue left, you can do it too. Now take a face towel and gently tap off the excess water and blot the bristles of your brushes. Role one side of the towel like the picture shown below and place your brushes on the towel in a slant position so that the bristles are facing down. This will help your brushes dry quickly. 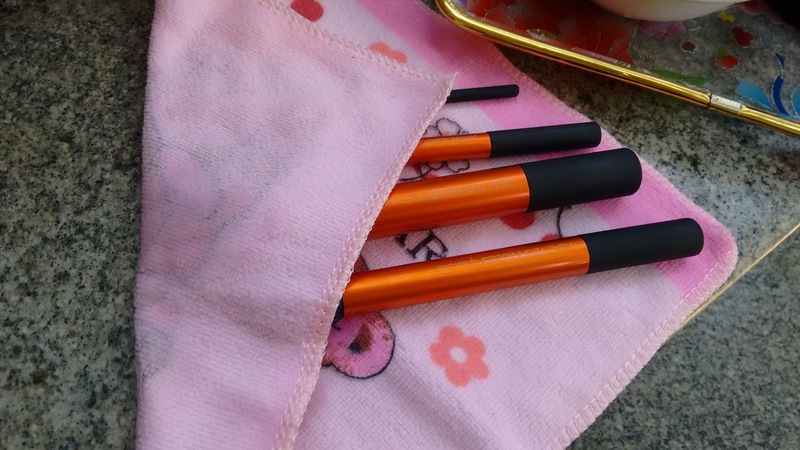 You can also use a tray for doing this or you can also hang your brushes upside down while they dry. Once your brushes dry they will regain their shape and you can fluff them to make them bouncy and perfect. And you are done, enjoy your clean and hygienic makeup brushes! Disinfecting makeup brushes is crucial and should be done once a while too. 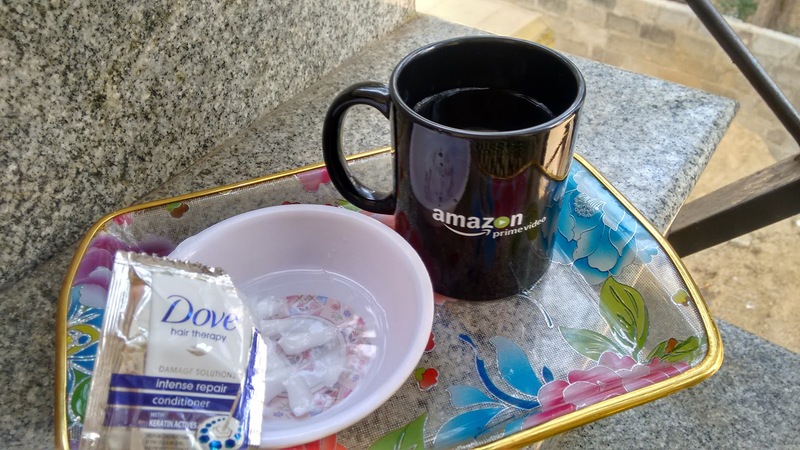 To do this take half a cup of liquid filled with two parts water and one part vinegar. Gently swirl your washed brushes in this mixture and run them under tap water to remove the vinegar residue and then put them to dry. You can also use 1tbsp of salt instead of vinegar for doing this. 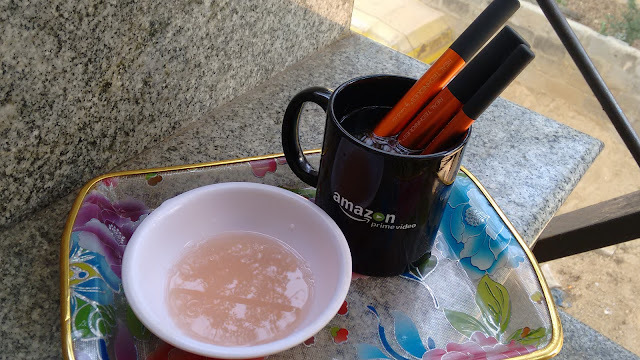 This is a very easy yet effective method to clean makeup brushes which leaves them clean, disinfected and all fresh to use. Make sure you never skip cleaning makeup brushes as this will prevent your skin from breaking out and reacting to makeup. NEVER forget to wash your makeup sponges and beauty blenders too, infact, they should be washed after every use as they are usually wet even before makeup is applied and they are used for applying liquid makeup which makes them a breeding ground for bacteria!